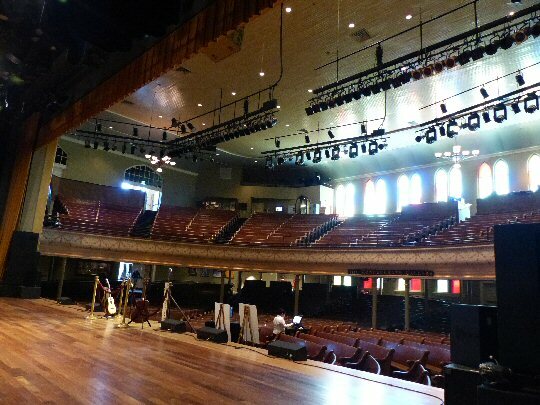 HomeMusic FeatureVisiting the Renowned Ryman Auditorium in Nashville, Tennessee, U.S.A. When you walk through the doors of the Ryman Auditorium you are stepping onto sacred ground. The Ryman aka the “Mother Church of Country” was baptized as the Union Gospel Tabernacle back in 1892. It was built by a saved soul named Thomas G. Ryman. After his death the structure was named after him. The Ryman became a hub for community activities including musical concerts. In its early days the Ryman was revered as the “Carnegie Hall of the South”. The historic Ryman Auditorium in the heart of Music City. From 1943-1974, live Grand Ole Opry radio shows were broadcast from the Ryman. So many greats including Cash, Cline and Elvis have graced her stage. The Ryman also begot bluegrass music when a young Earl Scruggs with Bill Monroe performed at the hallowed hall. In the 1970’s, the Opry moved to a new location leaving the fate of the Ryman in limbo. There was talk of knocking the building down but a large public outcry paired with the fact that pilgrims still came to see the Ryman led to her preservation. 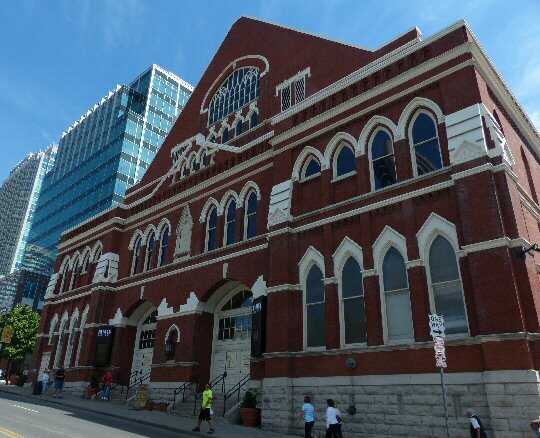 Then in 1993-1994, a major renovation restored the Ryman to its original glory. A museum along with the latest technology in comfort, lighting and sound were installed but most importantly is that the Ryman’s acoustics are still heavenly. The theater has won many awards and accolades. 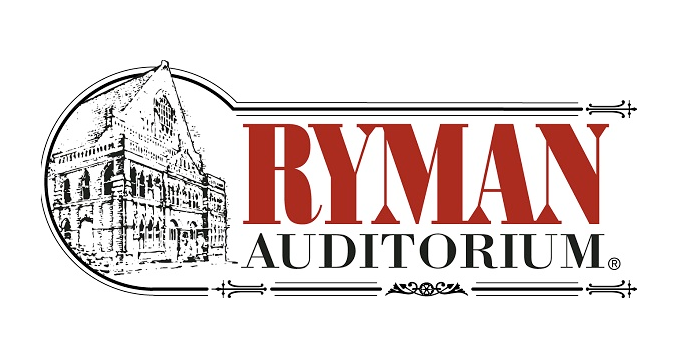 The late Chet Atkins declared it “the best sound in town…maybe in the U.S.!” In addition to concerts the Ryman has daily back-stage and self-guided tours. Inside the Ryman – a view from the balcony. We felt a certain awe as we started the Ryman Auditorium Backstage Tour knowing that so much musical history has taken place in this special space. We learned even more from our docent Tim. He informed us that the Ryman hosts not only Grand Ole Opry shows part of the year but 150-200 additional events, also. Although the venue is known for country music many artists from diverse genres have played here. In fact the day of our tour May 22, 2015, “Weird Al” Yankovic was scheduled to perform at the Ryman that night. On the tour, one can sit in the original pews that were salvaged during the renovation to enjoy a short film showcasing the events and people that have helped make the Ryman the crown jewel that she is. Along the back walls of the theater are cases of information and items charting its history from the 1940’s into the 1970’s. The Stage to Screen display explains the Ryman’s roles on the big screen and on TV. The theater is book-ended by galleries featuring more artifacts, paintings, photos along with an impressive collection of Hatch Show Print posters. 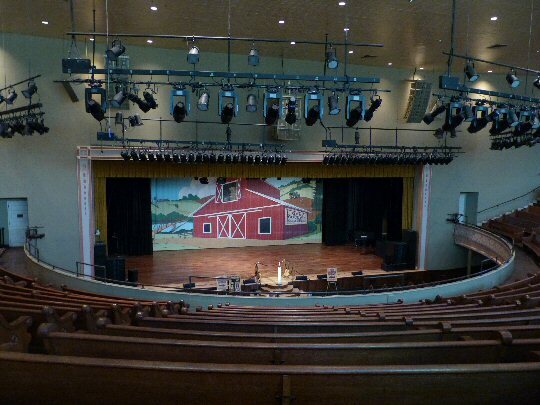 Inside the Ryman – a view from the stage. On The Daytime Tour, one goes back stage to see a number of themed dressing rooms. The first is dedicated to Johnny and June Cash who met at the Ryman. Many years later Mr. Cash’s memorial service would be held at the Ryman. A diplomatic hat draw determined who attended the event. The Lula Clay Naff make-up room is filled with signed photos to Lula who was instrumental in bringing many acts such as Rudolph Valentino, Mae West, Bob Hope and more to the venue. In the 1940’s, she arranged the rental of the Ryman to the Grand Ole Opry, thus changing the course of history for the Ryman and the genre. In addition to hosting the Grand Ole Opry – the longest running radio show dating back to the 1920’s – the Ryman has featured comedians, concerts, orators, politicians and a Confederate veterans reunion that took place in 1897. The Ryman (116 Fifth Ave., North) is a national landmark located in the heart of downtown Nashville. The “Mother Church of Country” is surrounded by venues with lots of live music, restaurants and boot stores. There is also a strong scent of BBQ in the air. The Ryman has a rich history paired with a bright future. It is considered a must see when in Music City – and, if you can, check out a concert – as she is renowned as one of the best sounding theaters in America. 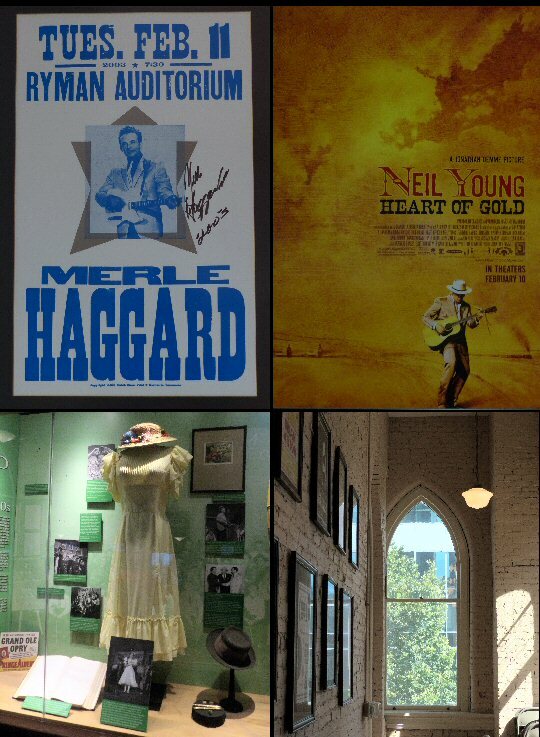 Inside the Ryman – artifacts and architecture.